And what this means for us is that if you come across headlines – as these days you very often do – which say something like ‘Vikings! Not just raiders and looters any more!’ then the headlines are wrong. If people weren’t raiding and looting (and land-grabbing, and collecting protection money), then they had stopped being Vikings. They were just Scandinavians. The trouble with reading a book that really excites you is that you end up highlighting passage after passage. Then it’s hard to pick one out to put at the head of a review. I finally chose one from near the beginning, but there were many others. I’ve posted an excerpt previously, because I did find Laughing Shall I Die: Lives and Deaths of the Great Vikings, by Tom Shippey an intriguing and exciting book in my favorite historical field. It’s been a long time since I’ve read one more intriguing. I don’t necessarily agree with all of it. In some ways Shippey’s thesis supports “my” work (Viking Legacy, which I translated), in some ways it contradicts it. I have praised Anders Winroth in a previous review (though disagreeing with him at many points). Shippey essentially discards Winroth as one who misses the whole point. The point being that the word “Viking” is routinely misused in our day. “Viking” means a seaborne warrior – a pirate. If you write about early Medieval Scandinavians in all walks of life and re-label them Vikings, you’re confusing the matter. To put it bluntly (again), most scholarly books with ‘Viking’ in the title turn out not to be about Vikings, because Vikings aren’t popular among scholars. This book is different: it really is about Vikings. 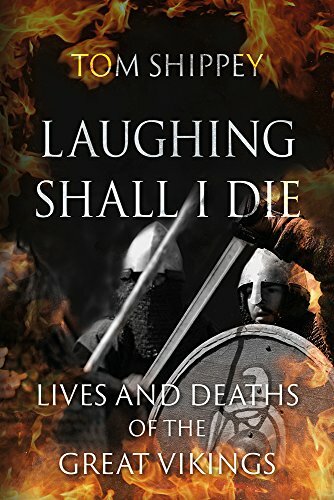 My friend Dale Nelson suggested I read Tom Shippey’s Laughing Shall I Die, a book on the Viking Age focusing on its warrior ethos. This isn’t a review, because I’m still reading the book. It’s quite long. But I’m finding it immensely congenial, a book that reinforces my prejudices – and who doesn’t enjoy that? 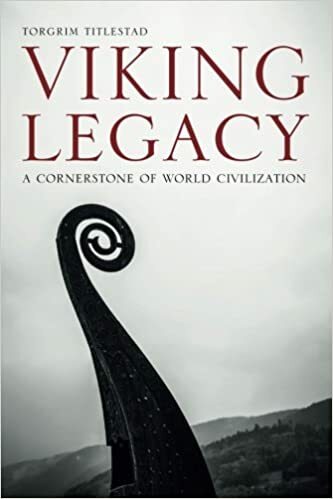 Broadly speaking, it’s a sort of a backlash book against the prevailing consensus in Viking studies, the one that says, “The Vikings were really pretty much like everybody else. They just got bad press because their enemies wrote the history books.” I must admit I’ve said the same sort of thing, especially at reenactment events, but I’ve always held secret reservations. Using modern terms, the story is one of centralizing power, professionalization of the military, disappearance of local groups and tribal names, and wars – so Hedeager suggests – to control strategic resources including land and access to bog iron. The last is a modern view, by a modern scholar who characteristically prefers sensible economic motives for war. Our ancient texts, like Beowulf and Hrolf’s saga, suggest just as plausibly that the wars were undertaken for glory, for revenge, to expand power. 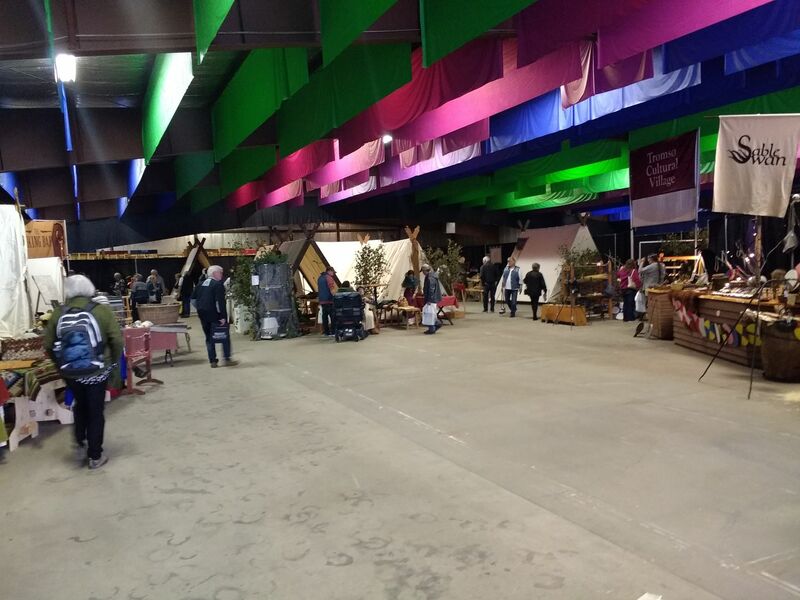 My side of the camp. There was a lot more to it. I got things a bit out of order yesterday. First day after a Viking expedition, I’m supposed to tell you about that. Book reviews after. But I forgot. How soon I forget. Anyway, fear not. 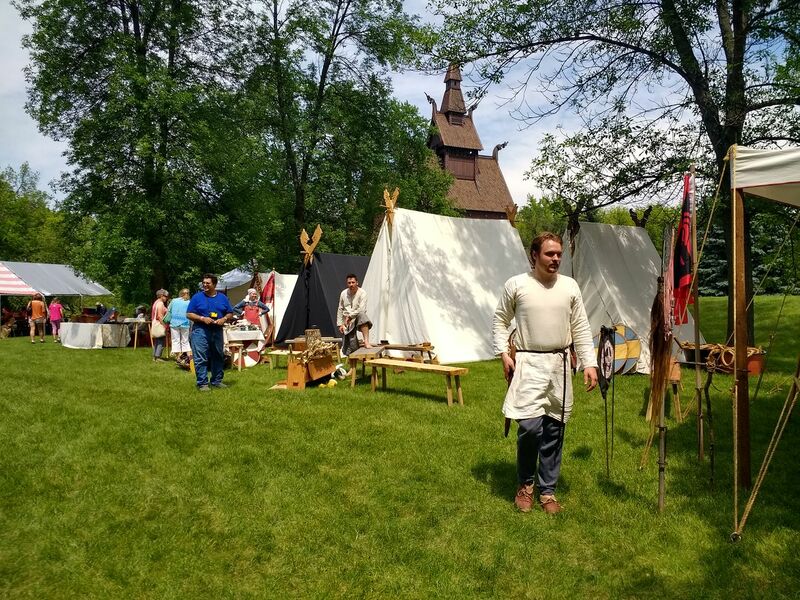 I shall now satisfy your burning curiosity about the Midwest Viking Festival 2018, at the Hjemkomst Center in Moorhead, Minnesota. This was the first long trip I’ve taken with the new Viking tent strapped to the top of Miss Ingebretsen, my semi-faithful PT Cruiser. I’m happy to report that it traveled well. I’ve developed a philosophy of tie-down straps, and they stayed tight. OK, I had to tighten them a little on the way, but that was because of a miscalculation I made with my anchoring; I learned a lesson from it to guide me in future. So I got there (this was Thursday), and a couple fellows helped me put my tent up (it’s not something you can do alone). Then I went and checked into the motel. I will not name the place, because I can’t really speak well of it. After I’d gotten settled, I noticed a smear of black grease on my hand. Eventually I figured out it came from a spot on the room door – an area around the latch. In time I worked up the nerve to complain at the desk. The manager told me he could change me to another room, or give me a cloth to clean it up. He didn’t have any staff on at that hour. So I took a cloth and a bottle of degreaser from him, and cleaned the door. Later I found a similar slick on the bathroom door, but by then I was defeated. I just avoided touching that area. 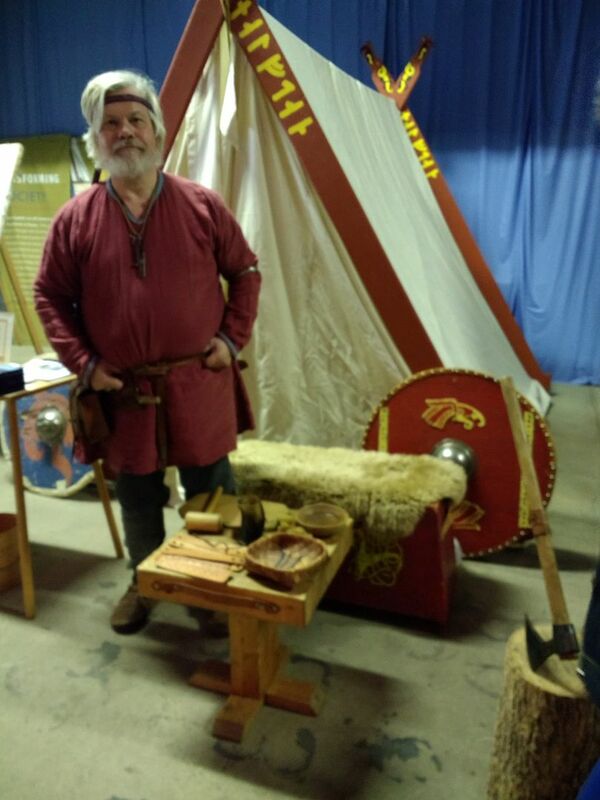 This Friday and Saturday I’ll be (God willing) participating in the Midwest Viking Festival in Moorhead, Minnesota. 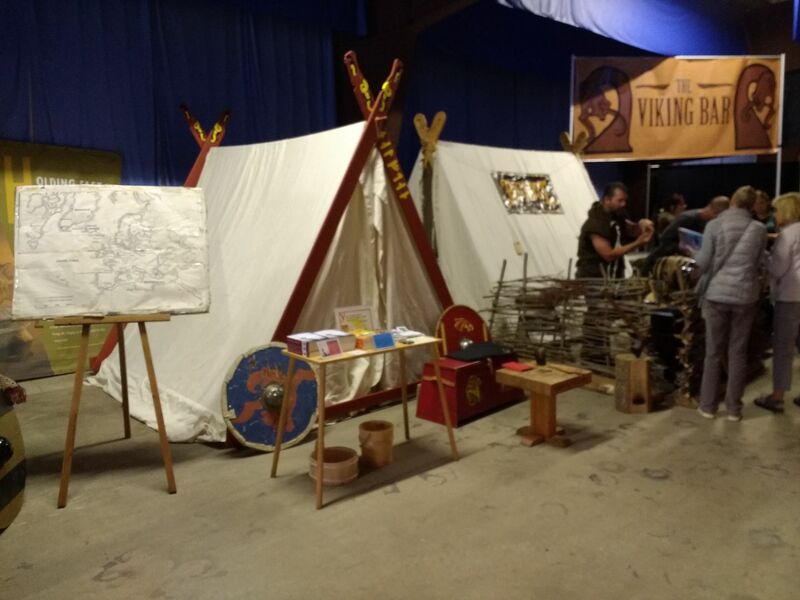 I’ll put up my new tent, and I’ll have Viking Legacy as well as West Oversea to sell to discerning visitors. Drop by if you’re in the Red River Valley. 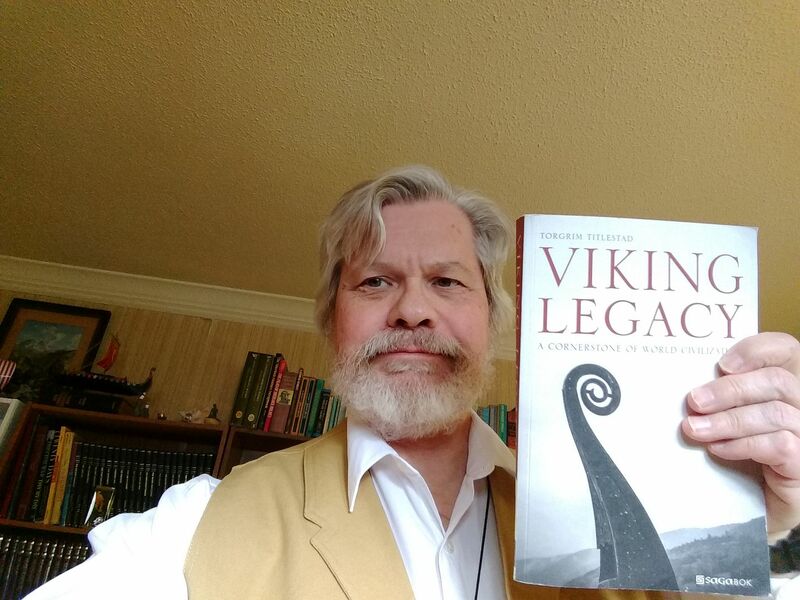 Today I got my complimentary copies of Viking Legacy, the book I translated. It’s always a strange and wondrous thing to finally handle a book you’ve only known in the abstract up till now. I’m not the author this time (in fact there are bits I don’t entirely agree with). But I worked long and hard on it, and did a lot of polishing. The translation still looks a little rough to me, especially at the very beginning, the worst place for it. The body of the text looks much better though. I like to think the “flaws” are the fault of the editors, but I’m not entirely sure of that. Anyway, it’s grown up and left the nest now, and I look at it, not as a father but as a sort of uncle, I suppose. I hope it does well in the wide world. In point of fact, this is an important, groundbreaking book. If it finds its audience it will be controversial. Buy it now and see why! I haven’t yet posted any links to Prof. Jackson Crawford’s videos. I have not viewed as much of his stuff as I probably should have, but what I’ve seen impresses me very much. In this short one he tells us how the Vikings pronounced a number of names of gods and mythological characters. If you’re wondering whether I pronounce them that way, no, I confess I don’t. But it’s good to learn.